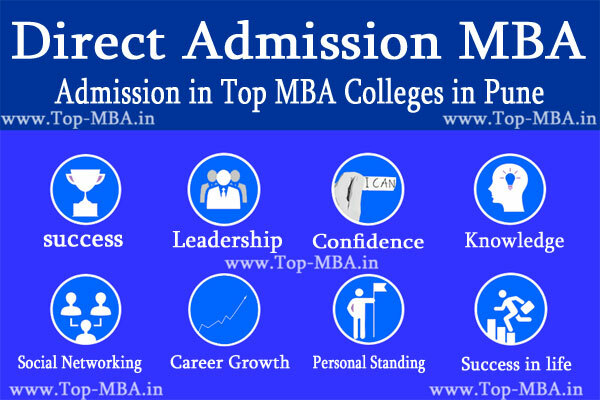 Direct Admission in Top MBA Colleges in Pune . Top-MBA colleges is very short and Easy Process for students . ( ✆ 9811004275 ) Students who have miss the opportunity to Write Direct Admission MBA Pune Entrance Exam or Score Less Marks to study MBA or Autonomous PGDM Program. Hence by missing Entrance exams they can get Direct Admission in Top MBA Colleges in Pune Maharastra as a Result. Also Direct Admission in MBA in Pune Without Entrance Exams and Direct Admission in MBA under Management Quota and Free College Level Seats Provided without Extra Charges . Please Find the list of colleges we providing Direct Admission for MBA in Pune for 2018-20 Batch. 11 National Insurance Academy 25, Balewadi, Baner Road N.I.A. P.O. 22 Zeal College of Engineering And Research S. No. 39, Narhe-Dhayari Road, Narhe, Pune-411 041. 25 S.N.G. Inst. of Management And Research A/P – Jaidwadi, Pune-Nasik Highway, Rajgurunagar. 33 Dhole Patil Education Society’S, Dhole Patil College of Engineering. 1284, Ubale Nagar, Wagholi, Pune – 412207. 34 Maeer’S Mit School of Management. Survey No.123, Saraswati Vishwa Building, A Wing, Paud Road, Kothrud, Pune. 411038. State Maharashtra. 56 Aditya Institute of Managment Sr.No.42(Part), Narhe-Ambegaon, Near Springdale School, Pune. 57 Sinhgad Inst. of Management, (Mba Programme) S.No. 44/1, Vadgaon (Bk. ), Off Sinhgad Road, Pune – 411041. 68 Gramodaya Trust’S Rajeev Business School Sr.No.31, Near Dange Chowk , Tathawade Road,Tathawade Pune- 411033.M.S. 92 College of Engineering Hadapsar-Manjari Road, Manjari Bk. 94 Navsahyadri Education Society’S Group of Institutions Gat. N0. 69,70,71, Mouje : Naigaon, Tal. Bhor, Dist. Pune – 412205. 106 Suryadatta Institution of Business Management & Technology Shree Ganesh,Building No. 2, Survey No. 342, Off Pashan Chandani Chowk Road,Besides Dsk Ranwara,Near Lalani Quantum, Bavdhan (Bk). 109 Rajgad Institute of Mgmt Research And Development S. No. 32/2/12 To 16, Opp. Dhankawadi Post Office, Dhankawadi, Pune – 411043. 110 Poona Inst. of Mgmt Sciences And Entrepreneurship K.B.Hidayatullah Road,Camp,Pune. 120 International Institute of Mgmt. Studies Survey No-54, Nere Duttwadi, Near Hinjewadi It Park, Pune-411033. 121 Shikshan Maharshi Dr. D. Y. Patil Center For Management And Research Gat No 1029,1030.1031 Next To Thermax Square,Newale Wasti, Chikhali Pune 412114. 122 Institute of Technical Education, Research And Management Sectro No.28, Ganganagar, Pcntda,Prof. Ramkrishna More College, Near Mahalsakant Chowk. 123 IIMS S. No. 169/1/A, Opp. Elpro International, Chinchwad, Pune – 33. 124 Trinity College of Engineering & Research Kondhawa-Saswad Road, S. No. 25 & 27, Post: Pisoli, Post/Office: Yewalewadi(Bopdev Ghat), Tal: Haveli, Dist: Pune. 125 Balaji Institute of Telecom & Management S.No.55/2-7, Tathawade. 126 D. Y. Patil Institute of Master of Computer Applications And Management Sector No – 29, Nigdi- Pradhikran, Akurdi, Pune – 411044. 127 Dr. D. Y. Patil Institute of Mgmt Studies Sec.29, Behind Akurdi Railway Station, Pradhikaran, Nigdi, Pune. 128 Mulshi-Institute of Business-Management-Pgdm Gut No: 237-243, Post- Sambhave Mulshi. 129 Arihant Institute of Business Mgmt . S.No. 276/1, 276/2, 277/1, 277/2, 278/2, Near Crystal Honda Showroom, New Mumbai-Pune Highway, Bawdhan (Bk.). 130 IM Institute of Mgmt Shivnagar Vidya Prasarak Mandal’S Campus Malegaon (Bk), Tal:- Baramati, Dist:- Pune, Maharashtra. 131 Indian Institute of Cost And Management Studies & Research (Indsearch) S.No. 37/2/2/4, Bavdhan Khurd, Pune-411021. 132 Mile-Management Institute For Leadership And Excellence Lexicon Estate Gut No 726, Pune-Nagar Road Wagholi. 133 Asm’S Institute of Business Management & Research (Pgdm), Pune Plot No.133, Midc, Block C’, Chinchwad, Pune 411019. Please Note (very Important for all ) That all the colleges in the list are not having any management quota seats. Admission is done strictly on merit basis . We provide admission in subject to availability of management quota/institute level vacant seats . No Extra Charges apart from tuition fees Charged. The Above Listing is an Advertisement Showing Top MBA Colleges in Pune and not for Direct Admission in Top MBA Colleges in Pune .